This article is about the Iris of the eye. For other uses, see Iris. Iris in humans, is the colored (typically blue or brown) area, with the pupil (the circular black spot) in its center, and surrounded by the white sclera. Overlying cornea is completely transparent so is not visible, except the high-gloss luster it gives the eye. Also pictured are the red blood vessels within the sclera. These structures are easily visible on any person's eyes. The iris (plural: irides or irises) is a thin, circular structure in the eye. It controls the diameter and size of the pupils. Eye colour is the colour of the iris. In humans, the iris may look green, blue, brown, hazel (a combination of light brown, green and gold), grey, violet, or even pink. In response to the amount of light exiting the eye, muscles attached to the iris expand or contract the pupil. 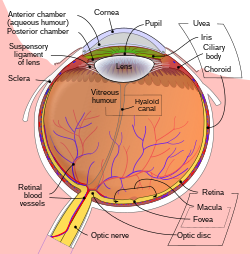 The larger the pupil, the more light can enter the eye and reach the retina. This page was last changed on 28 June 2018, at 12:11.